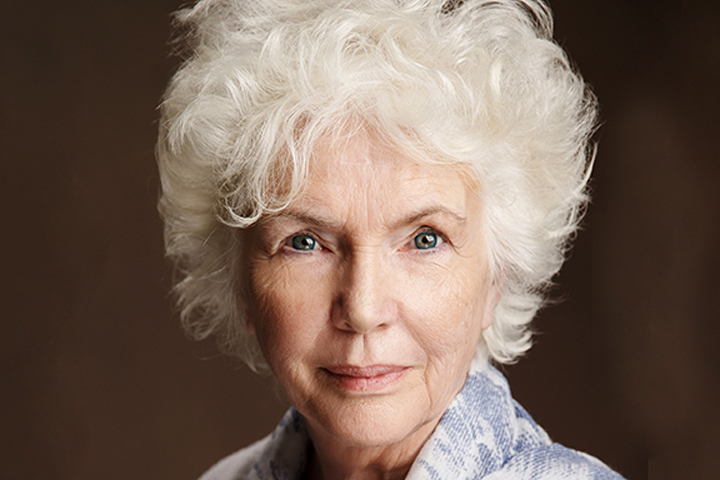 Fionnula Flanagan was born and raised in Dublin, Ireland. From an early age she grew up speaking both English and Irish on a daily basis. Her parents weren't native Irish speakers but wanted Fionnula and her four siblings to learn the language. Her mother used to say, "A nation without a language is a nation without a soul". Fionnula has said she will be forever grateful to them for that. She was educated at the Abbey Theatre School in Dublin and in Switzerland. She moved to Los Angeles in 1968 and lives with her husband, psychiatrist Dr. Garrett O'Connor, in Beverly Hills. Of her enormous body of work, including stage, television and film, she might be most well-known for James Joyce's Women (1985), in which she plays six different women who had a profound influence on James Joyce's life. Besides giving an award-winning performance, she also wrote, adapted and produced the piece for the stage, and subsequently as a feature film. She believes Joyce is the most important writer in the English language, most notably for "Ulysses", "Finnegan's Wake" and "The Portrait of an Artist as a Young Man". When she was growing up she thought the much lauded author was a good friend of her parents, because they were always saying, "Joyce said this, Joyce said that". When she was finally old enough to read Joyce for herself, the characters were like old friends. Flanagan came to prominence in Ireland in 1965 as a result of her role as Máire in the Telefís Éireann production of the Irish language play An Triail, for which she received the Jacob's Award in Dublin for her "outstanding performance". With her portrayal of Gerty McDowell in the film version of Ulysses (1967), Flanagan established herself as one of the foremost interpreters of James Joyce. She made her Broadway debut in Brian Friel's Lovers (1968), then appeared in The Incomparable Max (1971) and such Joycean theatrical projects as Ulysses in Nighttown (as Molly Bloom) and James Joyce's Women (1977; toured through 1979), a one-woman show written by Flanagan and directed for the stage by Burgess Meredith. It was subsequently filmed in 1983, with Flanagan both producing and playing all six main female roles (Joyce's wife, Nora Barnacle, as well as fictional characters Molly Bloom, Gerty McDowell, etc.). A familiar presence in American television, Flanagan has appeared in several made-for-TV movies including The Legend of Lizzie Borden (1975) starring Elizabeth Montgomery, Mary White (1977), The Ewok Adventure (1984) and A Winner Never Quits (1986). She won an Emmy Award for her performance as Clothilde in the 1976 network miniseries Rich Man, Poor Man. Her weekly-series stints have included Aunt Molly Culhane in How the West Was Won (1977), which earned her a second Emmy Award nomination. She did multiple appearances on Murder, She Wrote, one of them as Freida, a secretary aiding Jessica Fletcher in finding a murderer on the episode Steal me a Story (1987). She played Lt. Guyla Cook in Hard Copy (1987), and as Kathleen Meacham, wife of a police chief played by John Mahoney in H.E.L.P. (1990). The Star Trek: Deep Space Nine episode "Dax"
The Star Trek: The Next Generation episode "Inheritance", in which she played Data's "mother"
Flanagan guest-starred in several episodes of Lost as Eloise Hawking, a recurring character. She appeared in such films as The Others opposite Nicole Kidman, The Divine Secrets of the Ya-Ya Sisterhood as the eldest Teensy, and Waking Ned. She appeared in television series and stage productions including the Emmy-nominated miniseries Revelations, starring Bill Pullman and Natascha McElhone, and in Transamerica, starring Felicity Huffman. From 2006 to 2008, she played Rose Caffee, the matriarch of an Irish-American Rhode Island family on the Showtime drama Brotherhood. Flanagan appeared with Helen Mirren in Some Mother's Son, written and directed by Terry George, as the militantly supportive mother of a Provisional Irish Republican Army hunger striker in 1981. Subsequently, she spoke at a memorial hosted by Sinn Féin at the Citywest Building in Dublin for Irish republicans and their kin who were killed during the latest instalment of the Troubles in Northern Ireland. Flanagan and her late husband Dr. Garrett O'Connor, an Irish nationalist from Dublin, were known to host parties at their Hollywood Hills home for people in the Irish community. In July 2009, she joined Sinn Féin president Gerry Adams for a series of lectures across the USA supporting Irish unity. In October 2011, she announced her support for Sinn Féin politician Martin McGuinness in his unsuccessful bid in Ireland's 2011 presidential election. 1972 Gunsmoke Sarah Morgan Episode: "The Drummer"
1972 Bonanza Meg Dundee Episode: "Heritage of Anger"
1972 Mannix Gloria Paget Episode: "The Crimson Hero"
1976 Rich Man, Poor Man Clothilde Episode: "Part II: Chapters 3 and 4"
1976 The Streets of San Francisco Emma Simms Episode: "Requiem for Murder"
1976 Kojak Molly Braddock Episode: "A Summer Madness"
1987 Murder, She Wrote Freida Schmidt Episode: "Steal Me a Story"
1989 Columbo Louise Episode: "Murder: A Self Portrait"
1993 Star Trek: Deep Space Nine Enina Tandro Episode: "Dax"
1993 Star Trek: The Next Generation Juliana Tainer Episode: "Inheritance"
1993 Murder, She Wrote Fiona Griffith "A Killing in Cork"
1993 Dr. Quinn: Medicine Woman Heart Episode: "The Circus–The Queen of Hearts"
2002 Star Trek: Enterprise V'Lar Episode: "Fallen Hero"
2003 Law & Order: Special Victims Unit Sheila Baxter Episode: "Escape"
2004 Nip/Tuck Sr. Rita Claire Episode: "Agatha Ripp"
2017 American Gods Essie's Grandmother/Old Essie Macgowan Episode: "A Prayer for Mad Sweeney"
2018 "Law & Order: Special Victims Unit" Madeline Jane Thomas Episode: "Mama"